Each tube of Boiron Coldcalm contains approximately 80 quick-dissolving tablets. 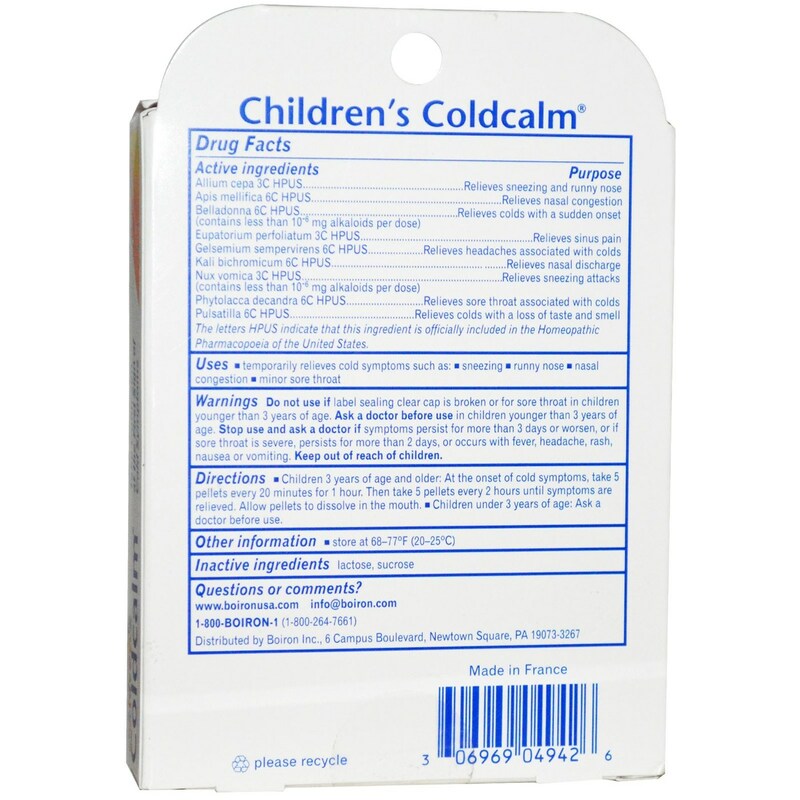 Warnings: Do not use if label sealing clear cap is broken or for sore throat in children younger than 3 years of age. Ask a doctor before use in children younger than 3 years of age. Stop use and ask a doctor if symptoms persist for more than 3 days or worsen, or if sore throat is severe, persist for more than 2 days, or occurs with fever, headache, rash, nausea or vomiting. Keep out of reach of children. Active Ingredients: Allium cepa 3C HPUS, Apis mellifica 6C HPUS, Belladonna 6C HPUS (contains less than 10-6 mg alkaloids per dose), Eupatorium perfoliatum 3C HPUS, Gelsemium sempervirens 6C HPUS, Kali bichromicum 6C HPUS, Nux vomica 3C HPUS (contains less than 10-6 mg alkaloids per dose), Phytolacca decandra 6C HPUS and Pulsatilla 6C HPUS. 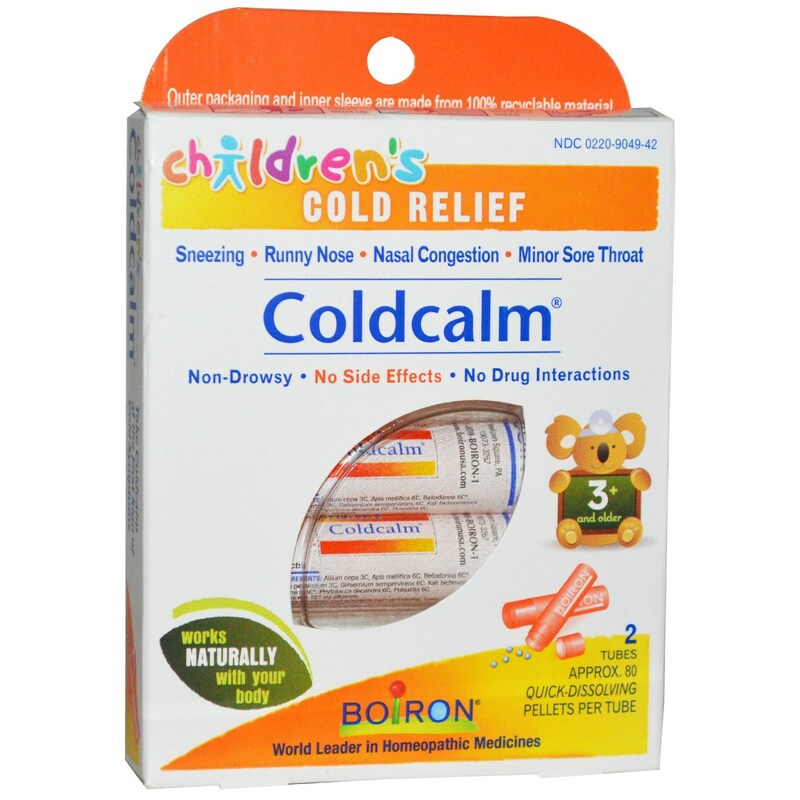 Recommended Use: Children 3 years of age and older: At the onset of cold symptoms, take 5 pellets every 20 minutes for 1 hour. Then take 5 pellets every 2 hours until symptoms are relieved. Allow pellets to dissolve in the mouth. Children under 3 years of age: Ask a doctor before use.